Africans bring their churches to U.S.
NEW YORK — About 500 worshippers, many from Ghana, filled the Church of the Pentecost in the Bronx on Palm Sunday. Each Sunday, in more than 100 New York churches, pastors preach the Gospel in languages such as Ibo, Twi and Ga. Conga drums drive songs of praise. Swaths of kente cloth cover bodies swaying in the pews. An explosion of African-immigrant churches in the past 15 years has helped reshape religious worship in the city. The surge is creating oases of Christian faith for newcomers from Nigeria, Ghana, Congo, Ethiopia and other countries and fueling an evangelical movement long the province of Latinos and African Americans. "They're having an impact beyond the African church," said Tony Carnes, a sociologist of religion and a co-editor of "New York Glory: Religions in the City." "The African churches are bringing new vitality and new ways of doing things to African-American and other churches," said Carnes, a co-editor of "New York Glory: Religions in the City." As membership increases, the churches are growing more visible in their neighborhoods. "People walk in and find community — friendly, African hospitality," Carnes said. "And second, there's this big emphasis on spiritual power in their services." As African churches attract increasing numbers of white worshippers, they can serve as a bridge between races, he added. In some cases, churches founded by white missionaries during the colonial conquest of 19th-century Africa are sending their missionaries to New York. Many churches have close ties to denominations back home, and use the same hymnals and prayer books. They import pastors or send them home to the mother church for training. The movement in New York and elsewhere in the United States is drawing the interest of scholars of religion. Mark Gornik, a Presbyterian minister, is writing his doctoral dissertation at the University of Edinburgh on New York's African churches. "Africans are taking their faith to Africans," he said, adding that in the city alone, he has counted at least 110 African-immigrant congregations that have sprouted since the late 1980s. They have names like the Apostolic Church of Ghana, Deeper Life Bible Church (Nigeria), Emmanuel Worship Center International (Ethiopian) and the Lighthouse Church of Ghana. The churches, Gornik said, are "very responsive to human needs. It is a home away from home for people." "It's like being among my people," he said during a Palm Sunday service. "It makes me feel as if I'm back home in Ghana. If I go to any of the other churches, I won't see this." Denominations have been multiplying. For example, the Redeemed Christian Church of God, a global Pentecostal movement based in Nigeria, came to New York in 1995 and now has 14 branches, said the Rev. Nimi Wariboko, pastor of a congregation in Brooklyn. The Presbyterian Church of Ghana, its roots planted by Swiss missionaries 175 years ago, has two outposts in the Bronx, one in Harlem and one in Brooklyn. The Celestial Church of Christ, founded in Benin but with a largely Nigerian membership, lists 12 New York branches on its Web site. Dozens of other independent congregations have popped up because individual African pastors received the call. 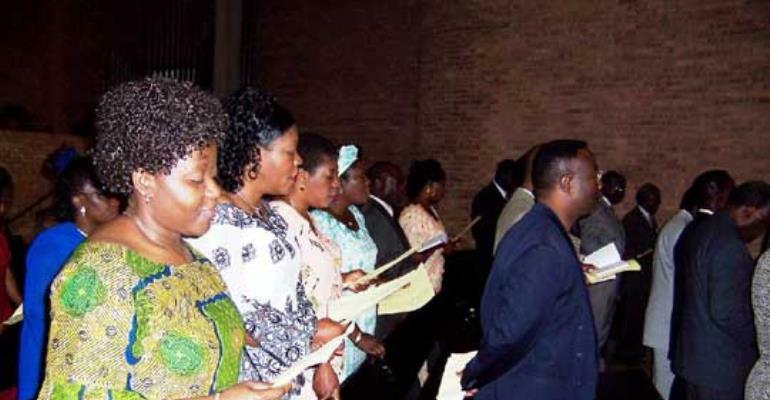 African congregations also coalesce within mainline churches such as the Methodists and Roman Catholics. But the most rapid expansion has come from Pentecostal and evangelical Christianity, which has surged in Africa and in other parts of the developing world. That energy has found an ignition point in a city where a tradition of religious tolerance and pluralism intersects with large-scale immigration. Most of the African congregations are from Nigeria and Ghana, sub-Saharan Africa's largest contributors of immigrants. But there are growing numbers of other ethnic congregations. According to census figures, New York's African population doubled from 1980 to 1990, and again before 2000, when 95,000 African-born people were counted. The number probably is higher because the count does not include more recent arrivals and many illegal immigrants. The population is expected to grow even more this decade, said Peter Lobo, deputy director of the population division of the Department of City Planning, who characterized the new arrivals as "overwhelmingly highly educated and professional." The new churches display a striking variety of worship styles and histories and often have strict codes of behavior: no smoking, no drinking, no eating of pork or "crawling animals," no lipstick in church. They help nurture such African customs as naming ceremonies, at which church members gather around a newly named infant. At the Christ Apostolic Church in Brooklyn, congregants bring jugs of water to be blessed by the pastor, Abraham Oyedige, a respected leader referred to as "Daddy," said Dale Irvin, the academic dean and professor of world Christianity at New York Theological Seminary. Members drink or wash with the water throughout the week before special occasions, for informal blessings, or for illness. "The water becomes a very powerful healing symbol," Irvin said. These churches create a cultural refuge, he said. "They are a way for Africans to pass on to their children their African values," particularly for African immigrants who see their children quickly assimilating into African-American culture. Some churches also provide an array of social services, such as help with immigration problems, jobs and health counseling. For Kwasi Ohene, 47, belonging to the Presbyterian Church of Ghana congregation in Harlem lets him strike a cultural balance. His father-in-law died recently, and the congregation is helping to pay for the body's return to Ghana, where tradition says burial should take place. "Since we are from the same place, people understand that," he said.